Unless you're a low-cost Bitcoin miner in China. Bitcoin is going through a rough patch. The value of Bitcoin dropped below $3,600 over the last week — a long fall from its average value last year of about $6,500. Analysts with JPMorgan Chase & Co. found that the cost of mining a single Bitcoin outweighed the actual value of the Bitcoin itself, Bloomberg reports. Analysts found the global average cost hovered around $4,060 globally in Q4 of 2018 — well above the current value. But that’s not necessarily bad news for everybody. The majority of the costs involved in mining Bitcoin (on a larger scale) come from paying for the power required to run massive power-hungry computer rigs. 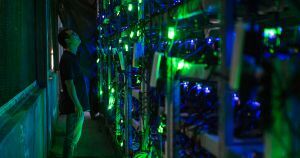 Bitcoin miners in China have found ways to reduce those costs significantly by setting up shop in the vicincity of power generators and cutting deals with them. That means they pay only roughly $2,400 on average per Bitcoin according to JPMorgan analysts. Despite the rising relative costs, many Western Bitcoin mining productions have yet to call it quits. In fact the same analysts found that production shares of miners grew slightly in certain parts of the world. Earlier this week, Reuters reported that JPMorgan analysts expected the value of Bitcoin to tank even further, down to as low as $1,260. Despite the pessimism, cryptocurrencies like Bitcoin tend to fluctuate significantly in value over short periods of time — the same quality that makes them so unpopular among banks. Could Bitcoin come back from the dead? That’s the outcome many mining productions are willing to bet their money on. Apple No Longer Allows Crypto Mining On Its Devices. That’s Good For Users.